I was at a Wisconsin Hardy Plant Society meeting where they said if the drought didn’t kill off your arborvitae, this unusually harsh winter of a lot of freezing rain and heavy snow surely has. At the same time, they mentioned there is no cheaper, hardier plant that provides such great benefits as privacy and a living wall. I love my arborvitae evergreens dearly. They provide punctuation marks throughout my garden. I will definitely be digging a few of them out and replacing them, but I am going to try a tip I learned from a Tibi Light talk first: for branches that are leaning over from the freezing rain, use pantyhose to tie them back in an upright position. 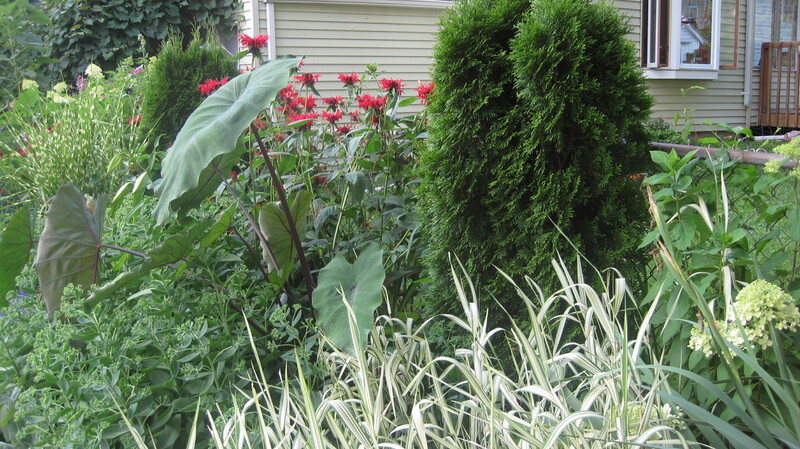 I love my arborvitae as much as I love going to fabulous gardening talks and learning new things about the garden! I wish you could come and design my garden, dear Mel.